If God controls the nations…. 2 Chron 20:5-6 Jehoshaphat stood before the assembly of Judah and Jerusalem at the Lord’s temple, in front of the new courtyard. He prayed: “O Lord God of our ancestors, you are the God who lives in heaven and rules over all the kingdoms of the nations. You possess strength and power; no one can stand against you. The formation of the people of Israel, created by God from one Babylonian pagan, Abraham. Or God sending Cyrus to capture and subjugate rebellious Judah. If God controls the nations, then He also controls individual people and events. How else do nations run, if not by very little details! This past year I read David McCullough’s historical account of the Panama Canal. God worked mosquitos, personality traits of leaders, weather, and human sin all together to bring America to the point to successfully take over the construction of the canal from the French. When the French began construction in 1881 of this, their second significant canal after the Suez Canal, no one in Washington, DC even dreamed that America would complete this project. But there were many details that God sovereignly organized into one surprising result. If God controls the nations, then He is controlling the details of my life right now. If God is God, then He is good. Therefore, the good God controls the details of my life right now. “Jesus went around doing good, healing the sick and feeding the hungry and blessing those who gave to the poor,” pointed out an advocate for social justice issues as primary. I overheard this discussion during an October radio conversation between two Christians explaining why they were voting differently; the first one for Hillary Clinton and the second speaker for Donald Trump. Each maintained that the party of his and her candidate best supported the teaching of Jesus. Clearly, what we focus on (as well as what we don’t look at or see) guides our beliefs and subsequent actions. each person advanced sincerely-held views, supported by an accurate understanding of a portion of Scripture. What do American citizens believe the Constitution delegates to the federal government to handle? Which problems/situations should fall under the purview of state, local or non-governmental groups of people and individuals? I don’t know how to reconcile the views any other way than what our Founding Fathers left in place for us: a representative republic, undergirded by a written constitution that allows for change. Whether you are upset or relieved with the results from 8 November, the system worked. No one is ever COMPLETELY satisfied, but that FACT is woven into the very fabric of our constitution. Our system is not perfect, but it beats many alternatives! Illogical Lucy – You have no right to say that abortion is wrong! Logical Joe – Why is that? If you participate in a bad action, you have no ground to stand on in order to claim that smoking is harmful. Young man, don’t start on the path of this foul and addictive habit. I once was your age. Just like you I wanted to fit in, to look manly. But boy do I regret it. I’m a pack-a-day guy now and, you hear this cough? – it’s not good. My doctor keeps threatening me that I’ll die young from Emphysema like my Pa and his dad. Besides, my mouth stinks, my wife doesn’t like kissing me, my clothes reek, and I spend about $40 a week on this nasty addiction. Your view doesn’t count. Your belief has no credibility. Your opinion is wrong out of the gate. Is that so? That bullying tactic is actually a version of the Genetic Fallacy. This maneuver draws strength from the false idea that the origin of the belief can de-legitimize the position. Logical Joes and Janes KNOW that a premise, that is a belief, position, claim or view must stand or fall on the merits of the reasons backing it up. It matters not at all WHO is putting forth the argument. There are only 3 elements that must ‘pass muster’. Are the terms in each of the premises clear or ambiguous? Are the premises true or false? Does the argument or syllogism follow a valid structural flow? If an argument contains clear terms within true premises, which lead to a ‘rule-abiding’ conclusion, then we say that the argument is both valid AND true and deserving of being considered SOUND. And a sound argument, my friends, is golden. Let us stand our logical ground with courage and courtesy and follow the same principles ourselves! Q: So where are you being bullied in the marketplace of ideas today? I live in North Carolina outside the town of Asheville. I read the daily newspaper, especially the editorial page and letters to the editor. The clear majority of published letter writers caustically and sarcastically attacks the predominately Republican state government that passed House Bill 2 (HB2), which then was signed, into law by Governor Pat McCrory. What has ensued from that legislative event has been mostly manipulative bullying (or bullying manipulation) by entertainers and companies such as Bruce Springsteen and PayPal. If one supports the bill, one is automatically branded a bigot. And the labeling is delivered via shouting. Where is the reasoned argumentation? There is none. No space is allowed for civil and thoughtful discourse. So what happens when one framing of an issue is repeated loudly and often enough? Nazi Joseph Goebbels might not have been the first person to arrive via inductive reasoning at this practical reality, but chillingly, his conclusion was born out in the Nazi horrors.”If you tell a lie big enough and keep repeating it, people will eventually come to believe it. The lie can be maintained only for such time as the State can shield the people from the political, economic and/or military consequences of the lie.” http://www.HolocaustResearchProject.org. In the current NC uproar, I would substitute LBGTQ movement supporters for ‘the State’. The other day I read the latest issue of Hillsdale College’s ‘Imprimis’. This publication reprints speeches of notable visitors to the conservative institution. I knew absolutely nothing about the baseball legend Ty Cobb. Nonetheless, what I DID learn reading this pamphlet was how naïve I might be to trust what I hear reported by ‘everyone’. Apparently it has been common knowledge for a couple of generations since Mr. Cobb’s death that he was a racist, violent and unkind ‘scumbag,’ if nothing else. But….the facts don’t bear this out. The historian who set about to write an even more salacious biography of the 20th century sports ‘hero’ found the truth to be more interesting than current (that is, current since Mr. Cobb’s death in 1961) documentation. Learning about the injustice done to a 20th century iconic figure has reinforced in my mind the desperate need for clear-thinking and kind logical Janes and Joes. Friends, there IS truth. And as people made in God’s image, we are called to look for, understand and argue for the truth, but ALWAYS in a winsome and grace-filled manner. Browbeating another person is NOT logic. May God help us to major in the ‘kind and logical’ rather than seeking always to be right and logical, at a cost to human dignity. It is arrogant to assume we see the Truth 100 % accurately. When I was a junior in high school, many of us wore POW bracelets to remind ourselves of those men still held prisoner by the North Vietnamese. I don’t know what happened to ‘my POW’ or the bracelet. But that memory was vividly stirred when I heard someone explain how ‘news’ makes a difference. The scenario he painted was of a wife, bereft of her POW husband, who still held on to the slim hope that he might be returned to her and their children. One day, she picks up the phone to hear the startling news that not only is her husband alive, but he is already safely travelling home on a naval ship. The Navy will pay for her to fly to San Diego to meet him in two weeks. After the phone call, her circumstances have not changed, for she is still without her husband. But the news of that future event WILL have an effect on her and the children. What’s this example have to do with truth? That’s easy: unless that mom trusts the veracity of the phone call, that it is NOT a hoax, then she won’t book the flight and make the arrangements to meet the ship when it docks. Truth DOES matter. So too does truth carry weight in a logical argument. Recall that to have a powerful position, two conditions must be met. Premises must be true and the way a conclusion is drawn must follow rules of logic. An argument that abides by guidelines in how it’s formed is deemed valid. Couple true premises with an orderly, valid proceeding from premises to conclusion, and you have a sound, or ‘unbeatable’ argument. I saw another example of the power of true premises this morning when I was reminded of the account of Hannah, future mom of the prophet Samuel. Mournful due to infertility and constantly belittled by ‘the other wife’ of Elkanah, Hannah refuses to eat but prays in the tabernacle during the family’s annual trek to worship at Shiloh. Hannah receives a blessing from the priest Eli when she prays in for a son (1 Sam 1:1-18). All she has heard is ‘news’ (Eli’s blessing) that the Lord will do for her as she requested while praying. When she arises from prayer, nothing has changed. She is still childless, but she has heard and believed the ‘truth’ given to her by this representative of God, the priest Eli. Here is a framework for this news and why it changed the live of our hypothetical POW’s wife and for Hannah, future mom of the renowned prophet Samuel. What happens after the ‘counting on something occurring that has been foretold’? Lives change! The POW’s wife and children felt joy during the 2 weeks before Dad reached American soil. They quickly sprang into action, prepping for Dad’s return. Perhaps a planned spring break vacation was cancelled. Hannah’s countenance immediately turned glad. She ended her mournful fast, took food and confidently did the next step of sleeping with her husband Elkanah in order to conceive a son. After dying, he was buried and came back to life 3 days later. His resurrection validated his prior public claims to BE God as well as demonstrated the truth of his announced purpose to live and die for helpless sinners. His punishment for our sins removed a holy God’s hostility toward men, opening the way to a happy father-child relationship. C: Therefore, I can make decisions, both day-to-day and long term, counting on those facts. Picture the glee, delight and joy of the POW family as they make plans. Mom is still a single parent juggling the demands of mothering, working and keeping house. Those circumstances haven’t changed. But her whistle and glowing face point to a significant change. Imagine Hannah’s attitude NOW when ‘the other wife’ with children mocks her. She still is slim and childless, but the taunting rolls off her back if she even notices it. She finds herself wanting to take in sufficient and healthy food to carry her future baby safely. Her mind is preoccupied with thoughts about the future. And we who are Christians who trust and act on the news of what Jesus has done for us also live life differently, although we still might be suffering in today’s current circumstances. What if we don’t EXPERIENCE joy or find ourselves meditating on meeting Jesus face to face? What if we actually FEEL and ACT the same as our neighbor who has no certainty of this paradigm-shattering historical event? Maybe it’s as simple as this: we haven’t been convinced what eyewitness testimony (the Gospel accounts in the New Testament) describes is true. Remember, faith (or certainty about an unseen but true event) grows stronger by hearing reports again of what Jesus has done. Truth DOES and should make a difference in our lives. Romans 10:17 – So faith comes from hearing, that is, hearing the Good News about Christ. 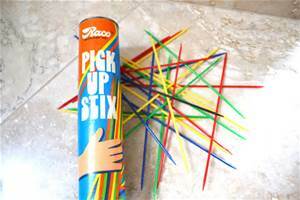 Do you remember the delicate touch you employed in order to play Pick up Stix? Dumping them all out on a table produced a challenging mess. Similarly when confronted by the onslaught of jumbled sound bytes that stand in lieu of rational, orderly arguments, we have to first untangle the issues before we can discuss what is being advanced. Recently my ‘go-to’ source for messy thinking, the Letters to the Editor page of the local newspaper, provided fun fodder. All persons who advocate the rights of the unborn should also advocate regulating the rights of handgun owners. Were I to dialogue face to face with this gentleman, I would gently point out that the use of a fallacy doesn’t take the place of marshaling reasons to support a claim. Just what is the fallacy? Look at his questioning technique I cited. That is nothing more than a ‘kind’ version of an ad hominem attack. Focusing on the character of your opponent is a weak substitute for a reasoned argument. Succumbing to a fallacy also communicates that you don’t know what else to say in support of your position! All objects that can be misused resulting in the accidental death of someone should be regulated by the government. Is he going to agree or balk? If he agrees, then take his argument seriously and push it to the point of the absurd. Doctors have traced a man’s kidney failure to his habit of drinking a gallon of iced tea each day. Black tea has a chemical called oxalate, known to cause kidney stones or even kidney failure in excessive amounts. But tea isn’t the only everyday ingestible that could kill you. Mr Letter-writer is going to have to limit the scope of his claim. His broad-sweep application of ONE situation (government regulation of drivers and cars) cannot, ipso facto, be applied to every situation. Keep him focused on how to solve the evil killing of the child. Actually, what both the wrong use of cars and the wrong use of guns has in common is the evil nature of the handler of either. Now THERE’s a topic worth discussing!